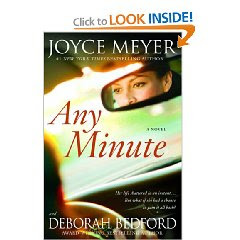 Any Minute by Joyce Meyer in October. I got this as an audio book from Paper Back Swap awhile back. It came to me new in the shrink wrap, pretty cool! This was the first audio book I've ever listened to! It was almost exactly one cd to work and back so it only took me a week to listen to it. Sarah Harper is driven to achieve success no matter what the cost. She wants to do good and not hurt the people she loves--especially children and her husband, Joe--but her desire to succeed in her career too often leaves little time for family. One cold, autumn afternoon, all of that changes when Sarah's car plunges off a bridge and into a river. She is presumed dead by those on the "outside," but Sarah's spirit is still very much alive. What she discovers on the other side transforms everything about Sarah's view of life--past, present, and future. When Sarah is revived, she is a changed woman. And the unsuspecting world around her will never be the same again. After I finished with the audio cd I let my friend's mom borrow it. It was the first book she's actually "read" since I've joined their book club!! the 2 of us that listened to the audio cd liked it more than the ones that actually read the book. leave me a comment and link back to my blog on YOUR blog (leave me a 2nd comment telling me you did so). I will pick a winner on Friday, November 6th. I got the honors of picking the next book. I picked Even Now by Karen Kingsburg. I would love to win this for my mom who drives an hour to work every day. She loves to have audio books!